There are many different brushes you can sculpt with in ZBrush. Each brush has a unique property that allows it to do something the other brushes cannot. Also, brushes in ZBrush can be modified using several important controls such as Gravity, Wrap Mode or Density. You can create your own versions of any brush by adjusting the settings, saving the brush so that you can use it later. The Standard brush is the original basic ZBrush sculpting brush, and when used with its modifiers at their default values, it displaces outward the vertices over which it passes, giving the effect of adding clay to a sculpture. It can be used with all of the various brush modifiers, such as Strokes, Alphas, an edit curve, and so on. Pressing the Alt key causes the standard key to carve into, rather than build up, the model. The Smooth brushes smooth details on a surface towards an ‘average’ level of that surface. To learn more read the Smooth brushes page. Move can easily be used to modify facial features; to indicate emotions, or to achieve a more natural ‘asymmetric’ face. Three brush strokes give the model a slightly crooked smile and one eye that is (exaggeratedly, to show the effect) higher than the other. Move conveniently ignores certain brush modifiers (strokes and so on) that don’t make sense when using it. In contrast to the Standard brush, which pulls or pushes geometry along the normal of the surface under the center of the brush, Inflat expands geometry by pushing vertices along their own normals. This can be particularly important when you are doing sculpts that displace the surface a large amount with just one or two strokes. On the left of the image, creating spikes with the Std brush; on the right, the Inflat brush. In both cases, the all spikes were generated at the same time, with a single motion using the Spray stroke. Inflat spikes are perpendicular to underlying surface, Std spikes are all in the same direction. Elastic works similarly to the Inflate brush, but for some model types, is more accurate at maintaining the original shape of the surface as the surface is displaced. Experiment with both to see which is better for your work. Displace works similarly to the Inflate brush, but works to keep the details intact in such a way as to suggest that the form underneath has swelled or been displaced. The Magnify brush moves vertices away from the cursor, and optionally displaces them up or down; it’s the inverse of the Pinch Brush. The name comes from the appearance of vertices as you move the brush around using the DragDot stroke; the vertices literally look as if they are being magnified. The magnifying (pushing out) and displacement (pushing up) effects can be controlled separately. For example, to ‘expand out’ the vertices in part of plane, without offsetting the surface, set the Magnify value to 0, and Z Intensity to a satisfactorily high value. The Blob brush is particularly good at producing certain organic effects very quickly. In contrast to other brushes, the uniformity of its stroke is affected by irregularities in the surface under the stroke, which means that it typically produces short, irregular blobs; hence the name. This won’t be so apparent if it is used on smooth surfaces. The blob slider determines whether the brush pulls the surface out, or pushes it in. Pinch pulls vertices together; it is, roughly, the inverse of the Magnify brush. It is very useful for sinking in detail for creating clothing and wrinkles, and for adding hard edges to any form. The Pinch brush has been augmented with an elevation slider which allows the artist to pinch in and out along the surface of the model to really sink in detail or harden the edge. Note: As in the example shown here, Pinch is often used with LazyMouse to achieve smooth, precise ridges, even with multiple passes. The Flatten brush allows you to easily ‘press down’ parts of your model into planar surfaces. In addition, you can raise or lower the surface as you flatten it. 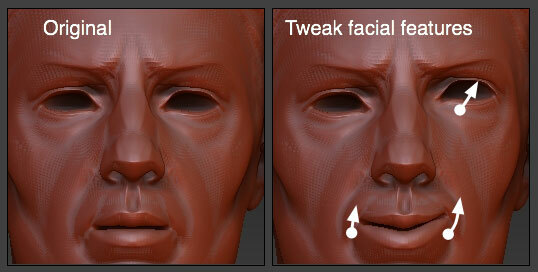 Using the Flatten brush, you can add rough flattening to you model, such as enhancing the plane of a model’s cheekbones. You can also achieve completely flat surfaces, for mechanical models, walls, etc. Note: To achieve completely flat surfaces, ensure you are working with a pure white alpha, and that the brush is set to completely cover the area you are flattening. Flatten flattens the surface towards a plane whose angle is determined by the area immediately under the center of the brush. As a result, using this brush with strokes or alphas that change the angles of areas of the surface may cause the flattening plane to shift around. To flatten to a particular plane, ensure you brush over a relatively smooth surface; for example, use the Smooth brush first, if needed. The primary purpose of the Clay brush is to sculpt surfaces using alphas. While the other brushes may be used to do this, they can have side effects that come about as a result of their ‘main’ purpose. The clay brush is intended specifically for sculpting with alphas, and will not cause other side effects. The Z Intensity and Clay slider values together affect the result of sculpting with the clay brush. The Morph brush is only active if the current model has a morph target set. In this case, the morph brush will brush the surface to which it is applied back toward the stored morph target surface. The Layer brush raises (or lowers, if ZSub is on) the surface on which it is used by a fixed amount, determined by the value of Z Intensity. The defining character of the layer brush is that when a stroke overlaps itself, the overlapping parts of the stroke do not undergo additional displacement. This makes the layer brush ideal for changing the displacement of an entire area by a fixed amount; simply scrub across the surface, without worrying about dragging the stroke over itself. If you set a morph target on the model immediately before you start sculpting with Layer, then Layer will sculpt to a constant depth above or below the original surface, regardless of how many strokes you use and whether or not they intersect. The Nudge brush allows you to move vertices around while (to the extent permitted by the density of your model) those vertices remain on the existing surface. Contrast this to the Move brush, which moves vertices in the screen’s xy plane, without paying any attention to the underlying surface. For instance : Think of adding a knothole to a tree trunk. You’ll likely want the original geometry of the trunk to flow around the new knothole, so you could use the Magnify brush to quickly move vertices out from the center of the knothole, do a local subdivision to add more geometry in the knothole area, and then use Nudge to get that geometry tuned just right for the slightly irregular shape of the knothole. The SnakeHook brush allows you to easily pull out horns, tendrils, branches, and other extrusions from a 3D surface. This is work that previously would have required a good deal more time using multiple tools. It is a good brush to use with DynaMesh which can remove the stretched polygons that result from using the Snakehook brush. The ZProject brush utilizes the Z axis of the canvas to transfer sculpting and texturing details either from the canvas or other from subtools.